Coiling is a unique basketry technique in that it is stitched rather than woven, spiralling from a central point, similar to coiled pottery. 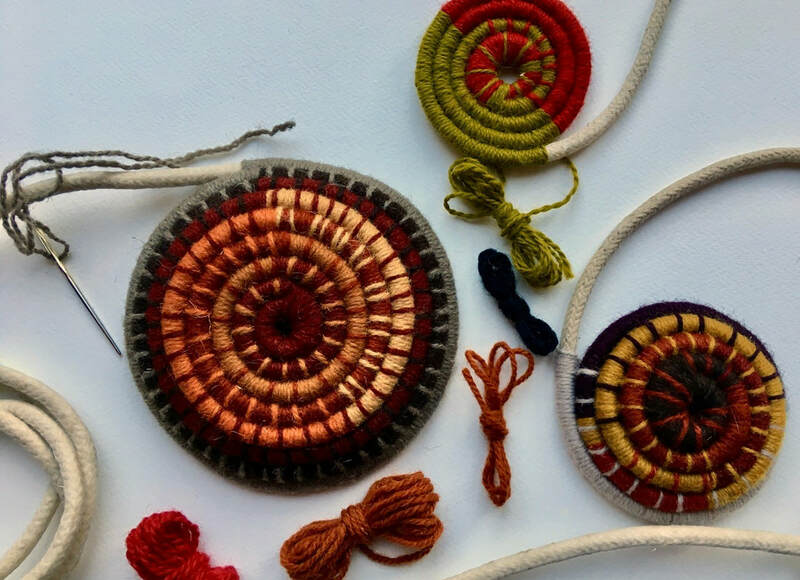 It is a technique traditionally used in many places around the world, including in parts of North Africa where the Berber People make patterned coiled basketry using colourful wools and yarns. It is a slow technique, so depending on how fast you work, and how big you want to make your basket or mat, it might be necessary to complete your basket at home, but if this is the case you will receive plenty of demonstration and instructions on how to finish off your work - it’s very straightforward to do. All materials and equipment will be provided to make a small coiled basket. All materials will be provided by the tutor. The approximate cost of these will be £10, payable to the tutor during the course. The items you will need to bring with you are listed below. ​​The tutor may not have the facilities to take card payments for materials in the workshops. Please remember to bring cash or your cheque book if your course involves buying materials from the tutor.